Having defeated Barcelona in the 1993-94 UEFA Champions League finals and just missing out the year before after a loss to Marseille, Italian club AC Milan was on a roll having qualified to their third consecutive UCL final in 1995. Their opposition, Dutch super-power AFC Ajax with the likes of Clarence Seedorf, Marc Overmars, Edgar Davids, Ronald de Boer, goalkeeper Edwin van der Sar and of course former Milan Dutchman Frank Rijkaard. Milan would go on to lose the match by a final score of 1-0 after second-half substitute Patrick Kluivert slotted the ball into the back of Sebastiano Rossi's net with just 6 minutes remaining in the match. But being obviously crushed about losing their second Champions League final in three years did not stop AC Milan Director of Sports Umberto Gandini from penning a super classy letter (sent via fax) to AFC Ajax's Gerard Holsheimer. The image of the scanned facsimile is below, together with a transcript of the letter for your reading comfort. 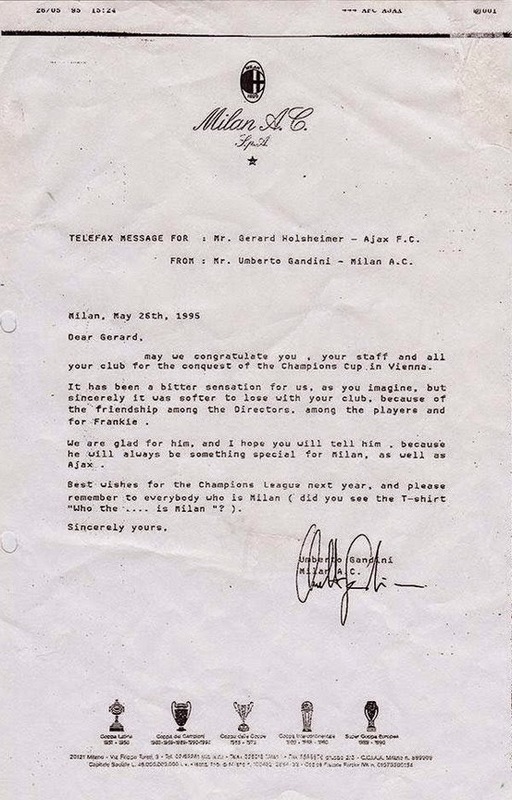 TELEFAX MESSAGE FOR: Mr. Gerard Holsheimer - Ajax F.C. FROM: Mr. Umberto Gandini - Milan A.C.
May we congradulate you, your staff and all your club for the conquest of the Champions Cup in Vienna. We are glad for him, and I hope you will tell him, because he will always be something special for Milan, as well as Ajax. Best wishes for the Champions League next year, and please remember to everybody who is Milan (did you see the T-shirt "Who the .... is Milan"? ).